It is hard to believe that Sony had a choke hold on the video game market during the last generation. It is strange that a company that had a installation base of almost 40 million people, could struggle so much only years later. More surprising, is the fact that from a technical stand-point, the PS3 has the most features, even better the least amount of add-ons. So why is the PS3 not dominating the market? I believe that it can be boiled down to loud-mouthed executives making promises and comments that eventualy come back to bite them. It all started at E3 in 2005 when Sony announced the PS3 at a very boring press conference that focused mostly on numbers and specs. The key points were the announcement of a spring 2006 release , gameplay graphics that are better than that we have seen in high-end CG cut scenes and the reveal of the new controller. As we all know, the PS3 did not release in Spring and came just in time for the holiday season of 2006. 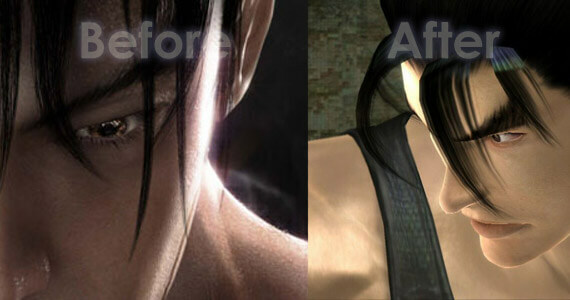 As for the graphics and controller, take a look at these two before and after images, they speak for themselves. I know we all agree scrapping the boomarang controller was the best idea Sony had, but to not come up with a new/updated design seems pretty lazy. 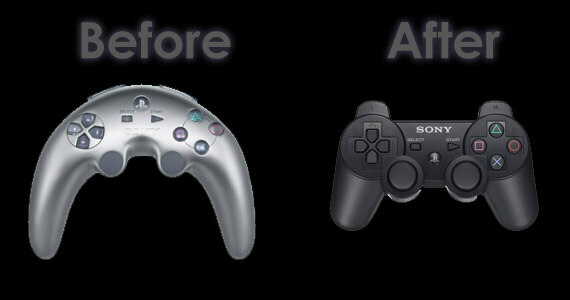 Especially for a controller design that was already one generation behind. The controller design brings me to my next point. Sony decided to do away with rumble in their controllers, saying it was a last generation feature. Even if that were the case, gamers still want force feedback in their controllers. To remove a standard feature from an existing design is downgrading it. If force feedback is a last generation feature, why did the Dual Shock 3 controller get released in November 2008? Probably because Sony finally figured out how to make the motion control not get affected by a rumble feature and realized they made a mistake. Another poor design choice early on came in the games. Initially, Sony opted out of doing a cross-game reward system (Achievements) even though they saw how successful such a system was on Microsoftâ€™s Xbox 360. When rumorâ€™s came up about the PS3 games having achievements at launch, they were shut down instantly. Obviously gamers did compare non-like titles because Sony released a reward system in 2008 in the form of trophies. The problem with this is that there were so many games released without trophy support, so Sony had to go back and add them to top games previously released. With this came another problem. If you had already finished a game before trophy support was added, you would have to go back and do it over to get the trophies. Not a very rewarding system if you ask me. Another misstep came before the launch. At a press conference, Sony President Ken Kutaragi said the PS3 would be capable of running games at a whopping 120 fps. As we all know, the PS3â€™s main problem with running games is the slow-down experienced, notably in multi-platform games. This is an ongoing issue. Even on the recently released Dragon Age: Origins, IGN comments on the frame rate drops being worse on PS3 â€“ the most powerful console out there. After three years, it is very surprising that a console that was supposed to be more dominant (on the technical side) has a harder time running games than its competition. Maybe it is the fact that the PS3 is a programmerâ€™s nightmare or the fact that Microsoft released the Xbox a year earlier so developers had a year to fall in love with it. The biggest negative could be something that hasnâ€™t happened yet, but looks as if it may. Sony has always thought their online is supperior to that of the Xbox 360. They believe that the PSN has almost all of the features as Live, but their service is better because it is Free. Now rumors are swirling around the internet that Sony will start charging people to go online. There is even a survey that surfaced online which breaks down different subscriptions for the Playstation Network. This survey (seen below) details a few different options ranging from $29.99 to $69.99 (more than Xbox Live) a year. The survey doesnâ€™t seem to list online play, so it may remain free. If it doesnâ€™t, I feel that Sony will lose a their competitive edge entirely. Donâ€™t get me wrong; the PS3 is a good system. Sony has had a solid year and has made numerous steps forward. PS3 now has some good exclusives and is still a top Blu-ray player. I just think if they start charging money for their online network, they will be taking a giant step back. Since the console has had a rocky history so far not meeting expectations, this could be a huge mistake. Sonyâ€™s â€œFree Onlineâ€ has been their battle cry over the last couple of years and if they lose that they have nothing â€“ they cantâ€™ really lower the retail price of the console yet again. What do you think about Sonyâ€™s falling back on their official statements and the potential for having to pay for PSN?